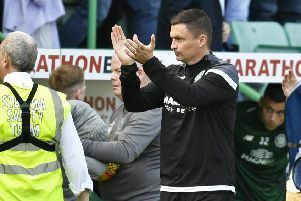 Hibs boss Alan Stubbs has revealed he’s hopeful Jason Cummings will sign a new deal at Easter Road as the young striker’s reputation grows with every goal he scores. The 20-year-old has been linked with a string of English clubs, the latest being Bristol City, whose new manager, former Hearts midfielder Lee Johnson, travelled to Edinburgh to take in Tuesday’s Scottish Cup replay between the Capital clubs. Johnson wasn’t disappointed, Cummings scoring the only goal of the match – his fourth in succession against Hearts – before picking up a second yellow card minutes from the end of an explosive encounter. It was the former Hutchison Vale kid’s 20th goal of the season, taking his tally to an astonishing 41 in 72 games, statistics which, Stubbs admitted, would make him surprised if there weren’t a few clubs sitting up and taking notice. The head coach said: “Jason’s obviously doing very well. He’s still got 16 months left on his contract. We’ve offered him a contract and we’re still hopeful that he will sign it but I am very comfortable about it. If it does come to a situation, he’s worth a lot of money. Strikers always are. While Scotland coaches Mark McGhee and Stuart McCall have revealed this week that Cummings’ team-mate John McGinn is in line for a call-up to Gordon Strachan’s squad, Stubbs believes the striker’s goals won’t have gone unnoticed in such circles. He said: “I tend to not really answer questions for people in other jobs but, if Jason keeps scoring goals, he plants a seed in the minds of Gordon, Stuart and all the staff there. He just need to keep doing what he’s doing. Meanwhile, Stubbs admitted he’s looking forward to his players being able to turn their entire attention to their push for promotion, their League Cup semi-final against St Johnstone and the two matches against Hearts having overshadowed the intervening Championship matches. Now, starting with tomorrow’s visit from basement outfit Alloa Athletic, Hibs have a run of four league games before the face Inverness Caley in the quarter-final of the Scottish Cup at the start of next month. He said: “That has always been our thought process. We want to get promoted. It has always been our main focus and playing against the Premiership teams makes you want it even more but we need to keep our side of the bargain, ideally going up as champions and, if not, we’ll do it through the play-offs if we can.